One of the most timeworn food challenges for parents is getting kids to eat their vegetables. It certainly hasn't gotten any easier for us moms and dads over the years. Our generation of kids is exposed to a wider variety of unhealthy foods now than at any point in history, with hundreds of millions of marketing dollars targeted specifically at our defenseless little ones. For many parents it's just too much of a battle to keep their kids away from prepackaged junky foods. Many finally give in, saying their kids are "picky eaters" or simply that they "don't like vegetables". It's a tough and seemingly endless struggle for us parents, but once you resign yourself to the "well, they just don't like to eat their greens"-type labeling of your little ones, the junky food has won out and kids feel like if they resist you enough -- no matter what the food -- they will eventually get their way. It takes a lot of patience and persistence to change their behavior, but with a few fun tips and always leading by example, my experience has shown that even the pickiest of kids will eat their veggies. 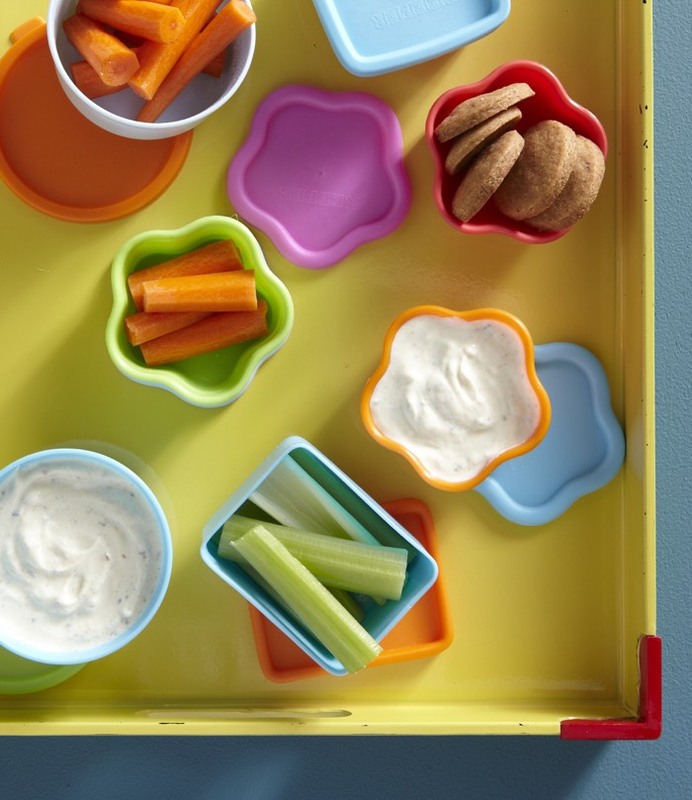 One of my favorite tips is to serve raw or steamed veggies with dips. When food is interactive for kids, it becomes a lot more fun for them to eat. I started making this versatile dip for myself years before I had my kids. I still eat it with steamed artichokes and even on grilled fish. With just a shake, squeeze and stir, you can turn plain ol' yogurt into something that tastes just like Ranch dressing (only it's much better for you). Whether you put a small serving of this alongside pieces of red bell pepper in a school lunch or serve it with an assortment of carrots, cucumbers, cherry tomatoes and green beans at dinnertime, this dip will help inspire the veggie lover in everyone! 1. Place all the ingredients in a bowl and stir to combine well. I am so excited about this I want to go try it right now! Only, which spike seasoning do I use?? THANKS! Hi! I'm excited about this too, but would love to know more about the seasoning you recommend. Thanks for all of your wonderful recipes! It's working in my house :). oooh a healthier version of ranch dressing! i still like dipping ;) ususally have baby carrots for snacks at work. You mention fennel how does your oldest like fennel is there a way you prepare it that he likes it best? Fennel has a licorice taste to it and it goes really great when you add it to dishes. I have steamed fennel and apples and made it into a sauce and it both kids gobbled them up! http://b12.ba4.myftpupload.com/2010/03/18/apple-fennel-puree/ You can also make it into a slaw with some cabbage. But the puree was a hit with us! My mom used to put fennel on steamed carrots. It made a great seasoning. Can you suggest something that I could substitute for the spike seasoning? Unfortunatly, I could not find any Spike seasoning. Can I use low sodium Mrs. Dash? How long will this keep in the fridge?? I don't have Spike seasoning on hand, is there a comparable substitute? You can use any salt-free seasoning blend! What brand are these little storage containers? !